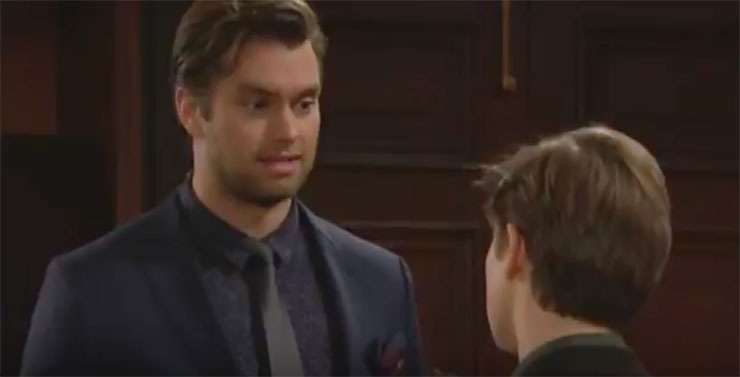 Thomas pulls big brother duty in The Bold and the Beautiful spoilers. The Bold and the Beautiful spoilers for Wednesday, April 19th, predict that Thomas tells his younger brother what needs to be done about the Spectras. Thomas (Pierson Fode) and RJ (Anthony Trupel) suffered a humiliating loss when their respective love interests turned out to be party to the fashion plagiarism of the season, the Spectras’ stealing the Forresters designs for their first big show. Thomas says he needs to put Sally (Courtney Hope) behind him, and RJ needs to do the same with Coco (Courtney Grosbeck). Meanwhile, Coco is emotional and brutally honest when she has a talk with her own sibling. Coco tells Sally that perhaps she was naive. Yet even a naive person wouldn’t have expected to be stabbed in the back and used by her own family. Trying his hardest not to gloat, Bill (Don Diamont) tells Brooke (Katherine Kelly Lang) he doesn’t know all the details of her and Ridge’s (Thorsten Kaye) failure to take their walk down the aisle. He did know, though, he says, that Ridge would live up to his history of repeatedly breaking Brooke’s heart and disappointing her. Steffy (Jacqueline MacInnes Wood) is on the war path after the Spectras shocking show. She tells Thomas and RJ they are to have absolutely no contact with Sally and Coco, respectively. She also tells Sally, “Any association you had with my family is over. It’s done, Sally Spectra,” saying those last two words with vituperative contempt. Next Article Soap Cities Exclusive: Jacklyn Zeman, Part 2–Bobbie, B.J., Geary, and More!